The 2016 Focus RS has been revealed, and it’s every bit as magical as we hoped it would be. Revealed this morning at an event in Cologne, Germany, the new Focus RS will be the horsepower-crazy AWD hot hatch that we’ve all anticipated. More than that, with the all-new Ford Performance All-Wheel Drive with Dynamic Torque Vectoring Control and a 2.3-liter EcoBoost engine expected to generate more than 315 horsepower, the Focus RS is the fun-to-drive insanity-beast that we’ve pined for and more. So, about that AWD. 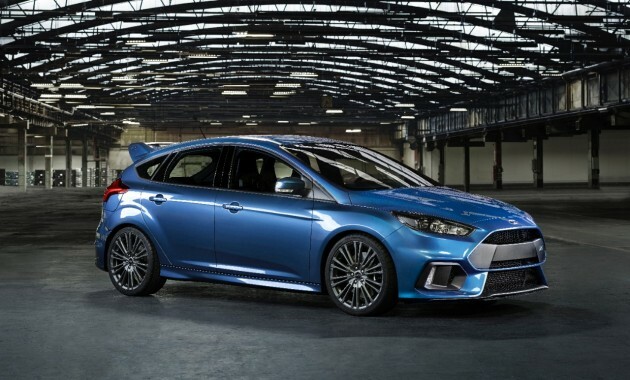 Ford Performance All-Wheel Drive with Dynamic Torque Vectoring will make the 2016 Focus RS an unsurpassed handler, using twin electronically-controlled clutch packs on either side of the rear drive unit, which will improve stability and allow up to 70% of the drive torque to be diverted to the rear axle. This means better grip, better control, better cornering, and better hooning. Speaking of hooning, it was revealed that Ken Block himself was a consultant on the new Focus RS. He appeared at the event in the flesh and in a video presentation wherein he ripped around a warehouse in the same Focus RS mule that he drove out to the stage. As has been expected, the Focus RS will be powered by the same 2.3-liter EcoBoost engine that powers the Mustang EcoBoost, only upgraded with a new twin-scroll turbocharger that increases output over 315 horsepower. And, yes, it will be mated to a six-speed manual. As a bonus, it looks incredibly sharp both inside and out. Oh, and it’s coming to America.